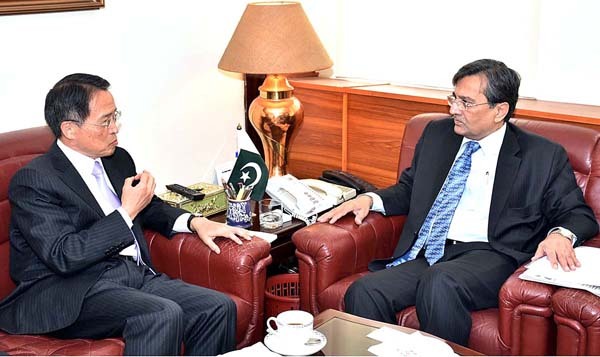 ISLAMABAD, Oct 24 (APP)::Japanese Ambassador Takshi Kurai called on Federal Minister for Commerce Mohammad Pervaiz Malik here Tuesday and discussed bilateral business and trade matters. The minister welcomed the ambassador and said that Japan being the 6th largest import destination was an important trading partner of Pakistan. “There exist tremendous potential between the two countries to increase bilateral trade,” he added. Pervaiz Malik said although Pakistan had GSP status and was facing on an average 1.4 per cent less duty than developed countries, yet the tariff imposed on its textile exports was on average 5.36 per cent higher than that being faced by its competitors like India, Bangladesh and ASEAN countries. He said that Japan was also a very promising market for Pakistan’s leather products but in that sector as well Pakistani products faced an average tariff of 16 per cent along with Tariff Rate Quotas which was higher than that offered to India and Bangladesh thus rendering Pakistan’s leather products in-competitive. “We want a level playing field,” he added. The minister informed the ambassador that Pakistan had framed terms of reference (TORs) for an early harvest programme leading to a free trade accord (FTA) and had shared with the Japanese side and that both sides had notified their respective joint trade committees. The first meeting of the JTCs was held on July 24, 2017 here. During the meetings, the Pakistani side raised the issue of pending TORs and final decision on the proposed early harvest programme. Takashi Kurai informed the minister that internal consultations were still being carried out and would inform the outcome by next JTCs meeting which might be held in Japan. He assured the commerce minister of full support of the Japanese government and said that more and more interaction of the governments and private sectors of both the countries was required to boost bilateral trade.